As we were chatting before we got started, Susan asked if I had seen The Pioneer Woman's recipe for Frito Chili Pie--she was excited and said it looked like so much fun serving chili in small bags of Fritos. When I asked if she'd like to make that instead, Susan answered with a resounding, "YES!" Off we went to the market to pick up the ingredients. Adapted from Ree Drummond's Frito Chili Pie. We doubled the recipe to split between our two families. This double recipe will serve 16. Brown ground chuck and Italian sausage in a large pot over medium-high heat. When the meat is cooked, drain all fat, then add garlic, onion and celery and cook until the vegetables are soft and wilted. Add beer, canned tomatoes, tomato sauce, salt, oregano, cumin and chili powder. Bring to boil, then cover and simmer on low heat for 30 minutes. Add drained and rinsed beans. Stir to combine, cover & simmer for another 20 minutes. Turn the heat back up to high to add the masa flour and water--the chili should be boiling. Stir to combine thoroughly and turn the heat to simmer for 10 to 15 minutes more. 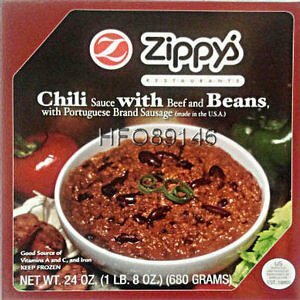 If you have the lunch-sized Frito bags, slit an opening in them on one side lengthwise, and scoop chili into the bags adding cheese and diced onion if desired. Serve immediately with plastic forks. A fun crowd-pleaser!